Wherein one fights to be seen, gives up, believes one should not be trapped under or behind glass, is proven wrong, and almost disappears. Told in parts. Image 1: A doctor’s office, one spring, a fat-as-hell file on a desk, quickly glanced through. The same questions, every time, the same ten minutes allotted in which to give a sixty-minute answer. I’ve got it down, now, mostly. I list the top three things wrong. If I attempt more, or if try to connect the dots between the things, the doctor’s eyes will shutter. They’re looking at me, and at my file, but they won’t see me. They’ll see words instead: difficult, anxiety, hypochondriac. These words are wrong, but they don’t know that yet, and I’m starting to not know that either. I’m anemic, in bone-deep pain, cold all the time, dealing with several out-of-whack joints, and my eyes are—… wait. That’s more than three things. I quiet down. I need medical care. I need to be seen. The word I get is anxiety, a prescription for that. Not for the other things. A “try meditation.” The doctor stands up, brushes excess words off their white coat. “Thank you for seeing me,” I say. Though I know they didn’t. Still, I should feel grateful for the visit. So I do. Soon we’ll be on the plane and I can sleep, I tell myself. Instead, I’m pushed into a holding alley—no choice given, no reason given, the wheels and the handles make it easy. Just to one side of the boarding line. Six other people, seated in wheelchairs behind me, beside me. We look at each other as the attendants close a plexiglass barrier that has a “no entry” circle and bar painted on it in orange and leave us there. We are caught behind the glass. We wait as each passenger walks past, some staring through the barrier at us, and board. I want to disappear. To not be behind this pane, to not be in pain, to be unseen, to not be like this. Image 3: A children’s hospital. The second one before I’m twelve. I’m listening behind the glass pane of a door while doctors talk to my mother about me. I’ve stood behind so many of these doors, listening. I’m opening the door, my hand twisting out like a snake. I’m sneaking my X-rays out of a manila folder and looking at my curves—the ones that aren’t supposed to be there. I know the things they’re planning are going to cause more pain, for my own good. They know it too. They say so to the X-rays. They say so to other adults, on the other side of the glass door. But just look at the curves, here and here. They say. See this? The X-rays are an indictment of my spine. Another set, somewhere, calls into question my infant feet. A third set, my jaw. Soon, my knees, too. The black and white images are all separated, disparate. No one’s connected the bones into a pattern that means all of me. Pieces of me are scattered across a swath of east-coast radiology rooms, where pieces of me are treated. Sometimes I look in the mirror and see only my eyes. I’m practicing keeping emotions out of them. Keeping pain out of them. I’m practicing smiling. I have to be in public again, and I don’t want the smile to accidentally look scared or hurting or too angry, even though I am all three. I don’t see any other part of me—which is better, I think, than seeing disjointed arms and legs, not attached to any recognizable whole. Image 5: “What’s happened to you?” someone asks—a different someone each time. They’re all starting to blur together. Each time, the same question. “You don’t look ___.” I use one of the quips I keep ready for when I don’t want to answer, because the explanation is too long and so much not their business. Bear Attack, I say. Bad Parkour Incident. “Rude,” they mutter. Or, “Pretty creepy.” As if I should be grateful they asked me for my cane-cred. As if I should be grateful that they saw me enough to ask why I was in their way. And I am, somehow. Just not enough. They see it. They see me. But it’s not good to be seen. Image 7: My dreams, where I am a child listening to adults tell me things about myself. Their words drift over me like soot. Attention-seeking. Sensitive. Liar. I know are wrong. But as they say them, I see them on me. I become the things they say. Image 8: A pile of mail. A denial of coverage: Improvement not seen. Image 9: A dark hallway, lined with glass cases. Skeletons, scalpels, “pickled punks,” one sign reads. Me, with my phone in my hand, waiting on another round of test results. The phone rings, the glass cases echo the call to the empty room. “Inconclusive,” the results. “You’re fine, a little odd in places, but fine. Come back in a year and we’ll see you again,” the doctor’s voice. Image 10: My fingers, a keyboard. Writing a different essay, about the reaction to my story, “Clearly Lettered in a Mostly Steady Hand.” About the main character; about anger. About how some felt it was scary, creepy, angry, and that was a good thing. About how one reviewer managed to write about the “genuinely creepy” story without ever mentioning the main character—the character who wanted to be seen instead of objectified. About how she absolutely disappeared from their review. I was going to hold those words up to you, in this essay. “See them,” I was going to say. About the main character fighting to be seen as more than parts, more than something behind glass. With all the agency, good and bad, that entails. Instead, I am writing all the scenes around this scene. I’m showing you what I see, all the time, and why this next moment means so much. The next morning, I wake up, a river of salt down my cheek. I look in the mirror and the first thing I think is: “I don’t want to be something wrong.” I break all over again. But I can see all my parts now, the joints between things. How each is connected. What holds me together isn’t right. It’s true. Pieces are painful things, separate or as a whole. There’s no cure for that, just workarounds. I’ve got a lot of work to do. But someone finally saw me. Someone stepped behind the glass with me. Even if what we see isn’t at all perfect. Even if there’s work to be done. Even if it’s only a start, it matters. 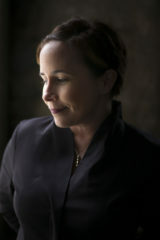 Fran Wilde’s novels and short stories have been finalists for three Nebula awards, two Hugo Awards, and a World Fantasy Award. They include her Andre Norton- and Compton Crook-winning debut novel, Updraft (Tor, 2015); its sequels, Cloudbound and Horizon; the middle-grade novel Riverland (forthcoming from Abrams in April 2019); and the novelette “The Jewel and Her Lapidary.” Her short stories appear in Asimov’s, Tor.com, Beneath Ceaseless Skies, Shimmer, Nature, and the 2017 Year’s Best Dark Fantasy and Horror. 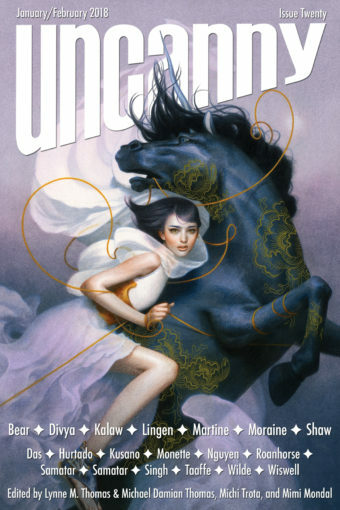 “Clearly Lettered in a Mostly Steady Hand,” which appeared in Uncanny, was a finalist for the Nebula, Hugo, and World Fantasy Award, and won the 2018 Eugie Foster Memorial Award. You can find her on Twitter, Facebook, and at franwilde.net.